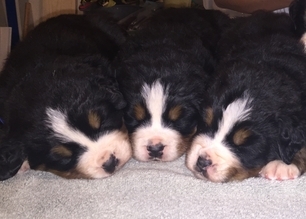 We hope to have at least one spring/early summer litter of Bernese Mountain Dogs in 2019 and 1-2 Fall/Winter litters as well. If you are interested in being considered for one of our puppies, please complete the puppy application. All of our puppies will come with a 2 year health guarantee for hips & elbows pending they are not obese, have been properly cared for per the referring veterinarian and our guidelines for feeding and development activity have been followed. We also offer a 24 month guarantee for eyes, cardiac and thyroid. At 24 months we will provide a complimentary OFA evaluation of their hips and elbows. This will allow us to see how the litter turned out. This evaluation will only be available complimentary at our practice in Monticello, MN. The puppies will be sold with a limited registration and future breeding will not be permitted. They will have received their first vaccinations, deworming, exam, microchip and dewclaws removed (BMD) We require that they be spayed or neutered by 11 months of age. We accept Cash. Cashiers Check or Paypal(2% fee). We will ship puppies to most states in the US and certain locations in Canada, however we would prefer that you pick up your puppy in person. Shipping will depend entirely on the availability of direct and quick flights as we do not want to endanger any puppies by transporting them over great distances and time. The cost for a crate and shipping is the new puppy owners responsibility. This can range from $400-$600 generally in addition to the cost of your puppy.